People have been hitting balls with sticks for a long time. When that activity turned into what would be called golf in the 1400s in Scotland, the evolution of the golf club and golf club history began. In the beginning golf clubs were made from available materials (wood) and by available craftsmen (anyone). There was no standard for design or set make up. Play and rules were haphazard and most clubs were hand made often by the players themselves. Around the early 1500s the set makeup began to be established. King James the IV had a set made for him and William Mayne was appointed the Royal Club Maker. A set of clubs at the time consisted of a set of play clubs (longnoses) for driving, fairway clubs (or grassed drivers) for medium range shots, spoons for short range shots, niblicks (similar to today’s wedges) and a putting cleek. After 1618, the “Featherie” golf ball was introduced which endured for more than 200 years. The featherie was made from three pieces of leather filled with “one Top Hat’s worth of fine feathers” and then sewn together. 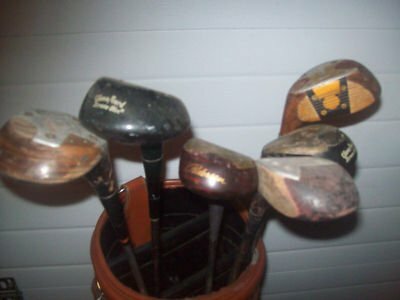 To keep these expensive, hand made balls from being easily damaged, most players used wood clubs even though iron was more accurate and controllable and hand “forging” was possible. The shafts of these wooden clubs were made from local European woods like ash or hazel. The heads of the wooden clubs were long and thin, and they were known for that reason as “long-nose woods”. They were made of “hard” woods like apple, beech, and pear. Early “irons” were made by local blacksmiths until around the late 1800s. As a result they were very crude and heavy with massive hosels and were very difficult to use. That and the fact that they easily damaged the featheries led to their limited use. The advent of drop forging in the late 1800s meant better iron clubs could be massed produced in factories. Wooden headed clubs were usually hand made by the local professionals until perhaps 1910, when factories began to take over due to the demand. Early golf professionals were prized as much for their club making skills as for their golfing skills. In some cases more so. Scotland became the mecca for great club and ball making. Early clubmakers like young and old Tom Morris and Willie Park exported their clubs all over the world. 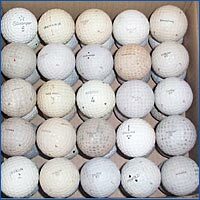 The craft of club and ball making was very lucrative in it’s day. Only the very wealthy in both America and Europe could afford the clubs and balls required to play the game. In the early 1800s, Scotland was known for fine club making much as Switzerland is known of fine watch making today. As we mentioned earlier, shafts were usually made from whatever local wood was available. When golf was introduced in America in the early 1800s, hickory wood began to be used in shafts, due to it’s availability. Hickory was far more durable and became the standard until steel shafts were introduced in 1925. Hickory became so popular for shafts that it was exported to Scotland and used by the premier club makers of the day. The hickory shafts required a slow, smooth swing to correctly time the hitting of the ball. They were also prone to breakage. Yet golfers adapted to the available technology and the game moved on. Those early featherie balls and hand made golf clubs dominated golf for almost 200 years. The first big change in technology came in around 1850 when the “gutty” ball was developed. This was made from a solid molded rubber called gutta-percha. It was much stronger than the feathery and now a variety of iron headed clubs could now enter the game. 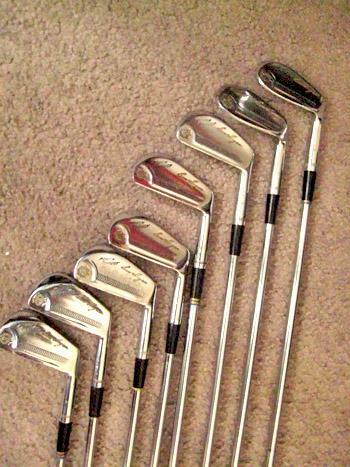 These new irons gave the golfer much better control and were durable enough to deal with awkward lies. 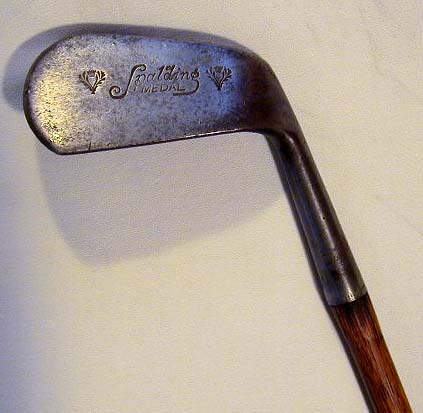 The period from 1900 to 1930 was marked by many innovations in club and ball design. 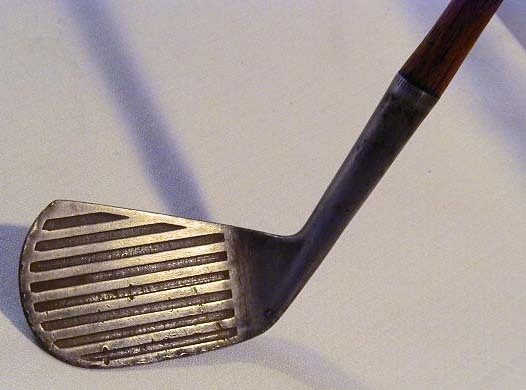 The early sand wedge was invented by Gene Sarazon and it’s design is still used today. American Persimmon became the wood of choice for the high quality woods due to its hardness and strength. One of the most important changes was the move from smooth faced irons to the grooves we use today. Clubmakers realized that you could impart more backspin on the ball with a grooved club. Increased backspin led to more distance and control. In 1898 the patented “Haskell” ball was invented and became widely used in the early 1900s. The Haskell was a composite of a solid core wound with rubber string covered in gutta percha. It gave the average golfer an additional 20 yards. It’s basic 3-piece design would become the standard for the next 90 years. Many variations in terms of materials and surface pattern were tried but not until 1972 when Spaulding developed the first 2-piece ball was there a new design. The 2-piece ball has emerged in the last 5 years as the design of choice. All along, golf clubs evolved to take advantage of the latest balls. New alloys and optimum materials were experimented with but no major changes took place until the 1990s. Although blacksmiths such as Thomas Horsburgh had experimented with steel shafts since the late 1890s, they were slowly adopted. The R&A only legalized them after the Prince Of Wales used them on the Old Course, St Andrews in 1929. Billy Burke was the first to win a major tournament with steel shafted clubs when he won the US Open in 1931. The obvious advantage of steel shafts was accuracy and durability. But they required an entirely different swing technique. The slow, languid, handsy swing of the 19th century and hickory shafts was replaced by a more precise and controlled body swing. Club head speed could now be maximized without requiring precise timing. The modern swing was born. 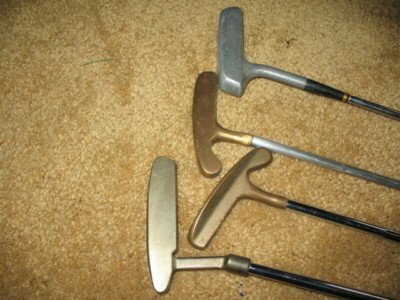 Into 1930s there was many variations of clubs available using both modern and traditional materials. 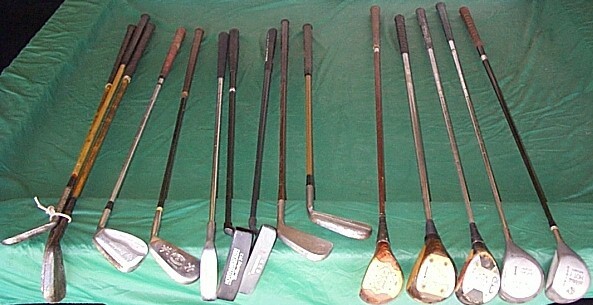 It was common to see golfers using 20-30 clubs of varying styles and uses. To get a handle on the numbers of clubs a player could use (and give the caddies a break), the R&A introduced it’s 14 club rule in 1939. The traditional names of brassie, mashee, niblick, etc. would also be replaced by the standard numbering system in use today. After World War II, the evolution of the golf club has been dominated by scientific research. New methods of construction and new materials have been introduced. The casting method was introduced in 1963. This made clubs m ore easily manufactured and therefore more affordable for the average golfer. Professionals and advanced players however still continue to use hand forged clubs because of the increased ‘feel’ and therefore control. The first graphite shaft was introduced in the early 1970s. Early graphite shafts, although lightweight and theoretically stronger, were inconsistent and prone to too much torque or twisting. Since then,manufacturing procedures have made those problems pretty much a thing of the past. TaylorMade was the first company to offer “Pittsburgh Persimmon” woods made from metal in the early eighties. Over time metal “woods” became more popular than persimmon woods and eventually totally replaced them. The latest trend is drivers with titanium heads and graphite shafts. Titanium is very strong and light and allows club heads to be made quite large without adding too much weight. Their thin faces increase the spring like effect of the ball off the club face and theoretically can increase distance. The evolution of drivers with larger and larger heads has been a major change in design and boon to golfers. Large heads offer a larger and more forgiving hitting area with benefits to both distance and accuracy. New designs continue to evolve, but the most sweeping changes may be over. Club head size for drivers has been limited to 460cc so the trend may have reached its limit. The spring like effect known a Coefficient of Restitution (COR) has also been limited so new designs that enhance that variable may be discouraged. Since cavity irons backs with perimeter weighting were introduced by Ping in the late 70s there have been no major iron innovations. Most manufacturers have been fine tuning that technology. The good news is today’s wide selection has provided many options for golfers. However, with so many choices it’s easy to wonder what is right for you. The new categories of Super Game Improvement, Game Improvement, and Players clubs may help clear up confusion. Check out our irons section to see the latest about today’s irons. Hybrid clubs offer the marriage of wood and iron technology and this new category has also offered major game improvement and forgiveness options in the long iron area. Every player in the game today is embracing this new technology. In particular, the set makeup of beginners and slower swingers like women and seniors, should completeley change as these new clubs are added to their sets. High technology has also entered the putter arena. Similar to iron innovation where moving weight has added major forgiveness for off center contact, putter design has gone high tech. The new mallet designs make major use of Moment of Inertia (MOI) technology to reduce twisting on off-center contact. Some of the more impressive changes in golf club technology has taken place in shafts. The advent of graphite as a shaft material has not only increased swing speed due to their lightness but also flex characteristics can be customized for swing speed and ball flight requirement. New shafts may offer the biggest opportunities for the future because their technology is still evolving. And of course golf club fitting may be the most important innovation in golf. Short of lessons, proper fitting may be the most important thing you can do to improve your golf game.